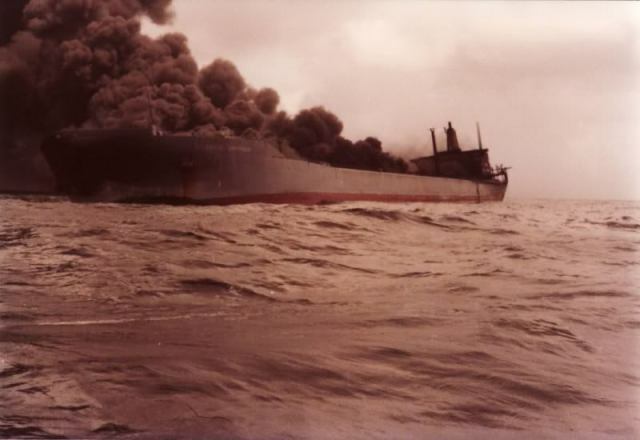 On July 19, 1979, two VLCC tankers collided off the island of Tobago in the Caribbean Sea. The collision killed 27 people and spilled some 280,000 tons of crude oil resulting in creating the fifth largest oil spill on record. The 347 meter long, 292,666 dwt VLCC Atlantic Empress was en route to Beaumont, Texas from Saudi Arabia. Built in 1974, the 5 year old tanker was headed to the Mobil Oil terminal with 276,000 tons of light crude oil. Heading in the opposite direction, the 210,257 dwt VLCC Aegean Captain was en route to Singapore with 200,000 tons of light and heavy crude oil from Curacao and Bonaire. Around 7 p.m., the two vessels were passing in the some 18 miles off the island of Tobago. Visibility was near zero as a tropical rainstorm with heavy downpours. Thus, neither vessel was aware they were on a collision course. On the Aegean Captain, the second officer caught sight of the the Atlantic Express as the two vessels were just meters away. He ordered the vessel to maneuver away from the Atlantic Empress, but there was no way to prevent the collision. The bow of the Aegean Captain struck a glancing blow into the side of the Atlantic Empress. 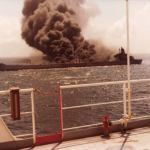 Immediately, there was a large explosion and both tankers burst into flames. On each vessel, the captain ordered the crew to abandon ship. On the Aegean Captain, the evacuation was orderly and were able to escape the flames. On the Atlantic Empress, there was panic among the crew. 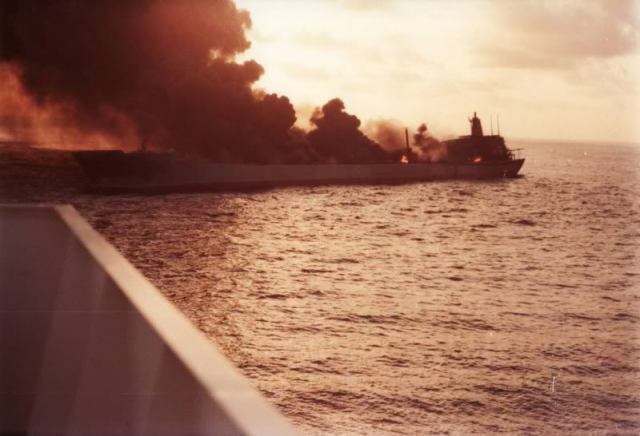 Many of the crew jumped into the burning seas or perished in the flames. Some 26 perished on the Atlantic Empress while only one crewman died on the Aegean Captain. The Atlantic Empress remained on fire and adrift. 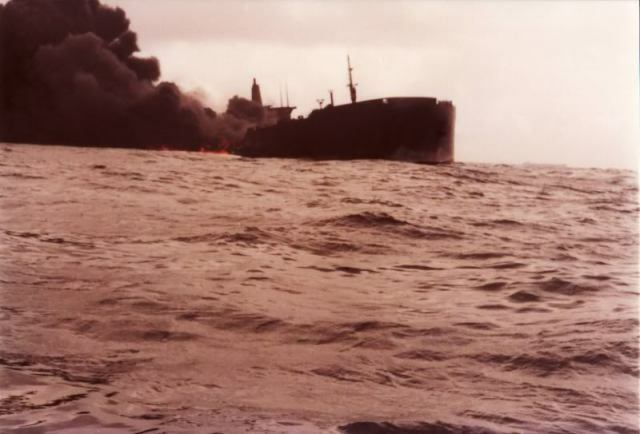 The fire ran along the entire starboard section of the main deck and the tanker had a 10 degree list. An oil slick was observed about 10 miles in length by 2 miles wide. A salvage team from Smit were dispatched to attempt to control the fire while two tugs were to take the Empress under tow and take it further out to sea. The salvage team was unable to control the blaze. 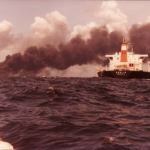 On the Aegean Captain, the fire was brought under control by the Trinidad and Tobago Coast Guard. Fortunately, the damage was limited to the starboard bow section. Disabled by the collision, the tanker was taken under tow by the tug Oceanic and was towed first toward Trinidad. Ten officers remained on board trying to repair damage. It was decided the Aegean Captain would be taken to Curacao. As the Aegean Captain was being towed, it was also releasing a small quantity of crude oil. The tug sprayed dispersants to control the environmental impact. When the Aegean Captain arrived in Curacao, the remaining oil was transferred to other tankers. 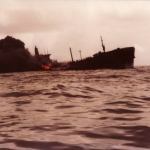 On July 24, the Atlantic Empress was still burning, but was 135 miles from Tobago. 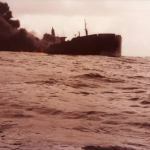 During the night the tanker had another explosion which increased the amount of oil being released into the sea. A flight over the area had a 50 miles oil slick visible, but it was not near any shoreline. The two tugs continued to spray water onto the deck in hopes to cool the intensity of the blaze. From July 25 to July 28, the firefighting efforts seemed to be working. The Smit salvage team reported that the amount of oil being released was slowing and fire fighters were able to board the vessel and closed water intakes, fire doors. 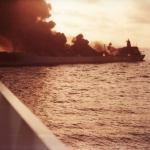 The fire was contained to just the two starboard tanks. The tanker Tasso was dispatched and was expected in a few days to be used as a lightering vessel. On July 29, the fire fighters renewed their efforts on the Atlantic Empress. Using 16 men using foam guns while 41 hoses were setup to spray water onto the decks, they were able to extinguish the blaze in one tank leaving just one tank still burning. By the end of the day, the fighter fighters left the Atlantic Empress planning to return the next day to extinguish the blaze. Just a few minutes after the fighter fighters left the tanker, there was large explosion on the Atlantic Empress. The flames reached 300 feet into the air and had blown some 35 to 70 feet of the deck open. 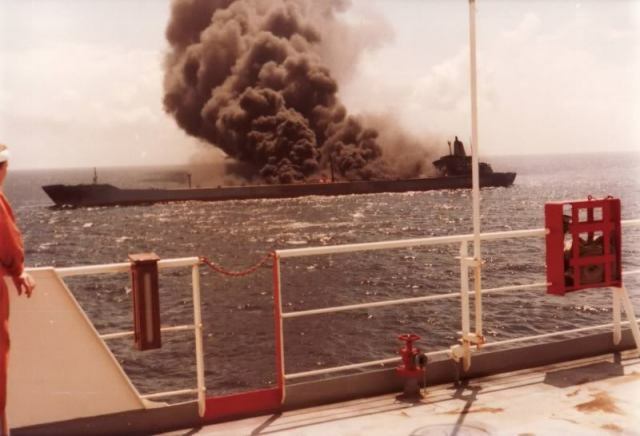 The explosion destroyed most of the firefighting equipment and the fire now was increasing to other portions of the vessel including 2 center tanks and a tank on the port side of the vessel. By August 2, the condition of the hull of the Atlantic Empress worsen. The hull plating around the starboard tanks had given way allowing a large quantity of oil to be released into the sea. The tugs let go the remaining towlines which signaled the end of any fire fighting efforts. 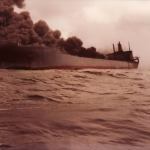 The Atlantic Empress gradually became engulfed in flames as oil pooled around the tanker. The tanker would partially sink with the bow still out of the water. Witnesses stated the bow was red hot from the intense fire until it sank. Aircraft reported flames extended 500 feet into the air with smoke reaching 6,000 feet into the air. The Atlantic Empress took nearly two weeks to sink after the collision. The fire consumed a large portion of the oil cargo, but there was still some 30 mile by 60 miles slick still visible. Aircraft flew over the area and continued to spray dispersants. No significant pollution reached the shore on the nearby islands. However, no impact study was conducted by the countries impacted by the pollution. Follow up reports stated the Atlantic Empress was more than 100 degrees off course. Neither vessel provided adequate lookouts and had failed to reduce their speed. Lloyd’s would pay out some $30 million in claims. Focus on this disaster would be eclipsed by the explosion of the drilling rig Ixtoc in the Gulf of Mexico.